Remember when I said I had been holed up in my sewing room. Well, here’s one of my most recent creations. In honor of Wolfsnail: A Backyard Predator, I decided to make a tiny quilt. I figure I can use it at presentation tables to add visual interest and give me something to talk about. I recently had a birthday and I got a new sewing machine. This one has lots of neat bells and whistles that I’ve never had in my decades of sewing. I am like a kid in a candy store. In fact, as soon as I finish this, I’m going back upstairs to the sewing room. Wall-hangings, Christmas stockings, and baby quilts await. So, how do you have time to do all this quilting and write, too? In-depth crafting and sewing projects are a distant dream for me, but my daughter is 4. Maybe there’s hope. I love your website/blog. I checked it out because I was trying to get in touch with you about the Yoder workshop. I’ll e-mail you separately about that. 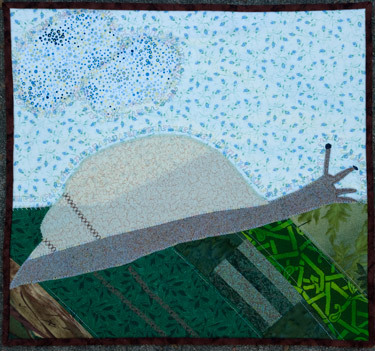 Snail quilt is very cute. It will make a great display for bookstore and school visits. Do you know April Pulley Sayre (Stars Beneath Your Bed: The Surprising Story of Dust)? I think she lives in Illinois. I think you two would have a lot in common, and you would enjoy some of what she says about writing.